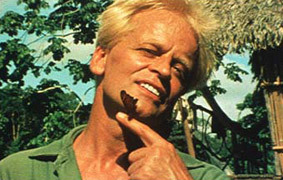 My Best Fiend, director Werner Herzog’s documentary about his turbulent relationship with Klaus Kinski and the five films they made together, got me to thinking about what Kinski, dead long before the movie was made, would have had to say on the matter. Herzog got to make the movie his way, creating whatever message he wanted to put out there, having the final word on Kinski with no possible rebuttal. Show a few scenes where he is a raving maniac, screaming obscenities at a crowd, relating stories of how the crew offered to murder him, and spend half the movie talking directly at the camera about your difficulties in dealing with his vast ego, and we will believe what you say. Show that sometimes he could be sweet and gentle especially opposite female leads (these scenes look more like an attempt to soften the monster he’s created), but always paint yourself as calm and patient, using Kinski’s bluster against him. Granted, all movies have a point of view, but it would work against Herzog’s massive ego to pretend he is anything but a long suffering saint. But, you say, didn’t Herzog ultimately have control over the films he made, and so this documentary would be no different? This is a rare case where that wouldn’t be true. Kinski’s control over the films he and Herzog made together is quite clear, not just because he was the lead actor, not just because Herzog often did one take within very long shots, but the energy created by Kinski’s antagonism towards not just Herzog, but the crew, was fueled into the movies themselves, creating wild, anarchic energy and tension, which worked perfectly with the atmospheres and unfathomable locations that were used to shoot in. Herzog battling the elements was patched right into the themes of the films and sometimes even ended up as scenes covering the dramatic struggle, blurring the line between the fiction on screen and the reality going on just outside the frame (dragging the boat up the hill in Fitzcarraldo being a perfect example). However, Herzog makes a point to show us what a professional Kinski was while the camera was rolling, like he blocked out all of his agita when it counted. It is why I find that the movies about his films, Burden of Dreams and My Best Fiend, are infinitely more insightful and dramatic than the movies themselves. While the energy and unpredictability of Kinski is evident on screen, he is confined by the material, even if he doesn’t follow the script to the letter. This makes it clear that while My Best Fiend is a great film, Herzog is not the most reliable and honest of narrators, he could not sacrifice his sense of self to give us more of the real story, only hinting at what he might have done to contribute, here and there, to his battles with Kinski. But the unreliable narrator is hardly confined to documentary, though usually in fiction, they are intentional. The filmmaker does run a risk of losing the audience’s trust when using one, and especially those viewers who don’t like to be fooled or tricked and resent not being spoonfed the reality of the universe being presented. 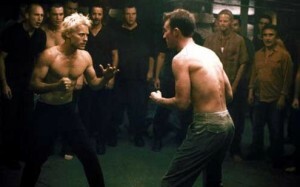 Both Fight Club and The Usual Suspects managed to use it quite well, though Fight Club was clearly more of a challenge because the movie is shot from Norton’s perspective (as opposed to Spacey telling a story to another person in The Usual Suspects) and Fincher had to consider how each event was colored by his perspective. Another example of an unreliable narrator within fictional films is David Cronenberg’s adaptation of William S. Burroughs’ Naked Lunch. 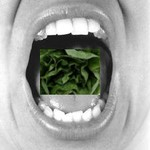 Cronenberg’s version of Naked Lunch is an amazing achievement. Not for the movie itself, but because he somehow managed to get it financed at all. This film appeals to such a small segment of the audience, mainly fiction writers who will appreciate the metaphors, and will alienate everyone else. 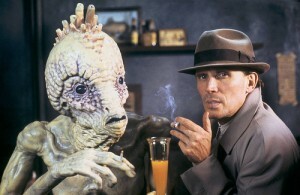 Since the film is 95% drug induced hallucination, basically, everything that happens after the point Bill Lee is arrested, we have to be invested in Peter Weller (playing Lee) quickly, which is very difficult since he plays the part at such a distantce. In fact Weller sounds exactly like Steven Wright the entire time, but without the underhanded irony. However, it does point to the fact that someone should cast Weller in a film noir quickly, before his thinning hair can’t even be covered over Travolta-style. 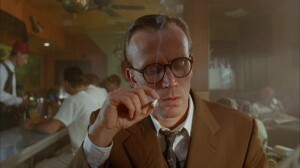 Though if Ed Harris got away with it in China Moon, I don’t know why the stiff Weller would have a problem*. Since the movie doesn’t satisfy on a literal level, the fantasy seems intentionally incomplete (the ending especially seems like a calculated dramatic event, to end the film on a distressing/repeated event, rather than a “natural” occurrence), the metaphoric level, where Lee battles with his paranoia about writer’s block/original style/selling out becames the only way to read the film. The typewriters, the foreign land, that inescapable frustration of having something to say in your own unique voice while competing with everyone else for publishers, each element represents something interesting, but there’s no connecting tissue, just a series of notions things that don’t tie together. It’s a bit frustrating that Cronenberg chose to play it so unsatisfying, because it’s not a matter of being enigmatic or obtuse, just filling in enough of the blanks so we can complete the puzzle in our minds. In terms of Weller as an unreliable narrator, Cronenberg keeps re-establishing that by repeatedly showing us what Weller sees versus the reality (e.g., the ticket is actually a syringe), and that seems to undermine how seriously we take Lee’s struggle. I think the fantasy element is overt enough for us to understand that Lee is under the influence of the bug powder causing him to lose touch, that it need not be thrown in our face all the time. Perhaps if he had done it progressively, revealing his delusions one step at a time, it might have worked, but now we just have an addict making a fool of himself and not remembering what he did the night before, while his friends struggle to keep him afloat in his work and personal life. *Judy Davis certainly had her fill of the doomed muse of various writers in 1991, with Naked Lunch and Barton Fink. This entry was posted on Thursday, April 9th, 2009 at 7:21 pm	and is filed under Documentary, Drama, Horror. You can follow any responses to this entry through the RSS 2.0 feed. You can leave a response, or trackback from your own site.